-- Please Choose an Option --	2.0 - 2.25" 1.75 - 2.0" 1.5 - 1.75" 1.25 - 1.5"
Hose Candy's Carbon Fiber Kevlar Hose Skin Kit for Upper Radiator Hoses is designed to improve the look of vintage "Goodguys" Hotrod engines and includes performance solutions for radiator and other engine hoses. Some customers didn't need Hose Candy for the lower radiator hose so we eliminated the lower hose parts from this kit to reduce the price. If you have a Ford Mustang check out our vehicle specific Mustang Kits. 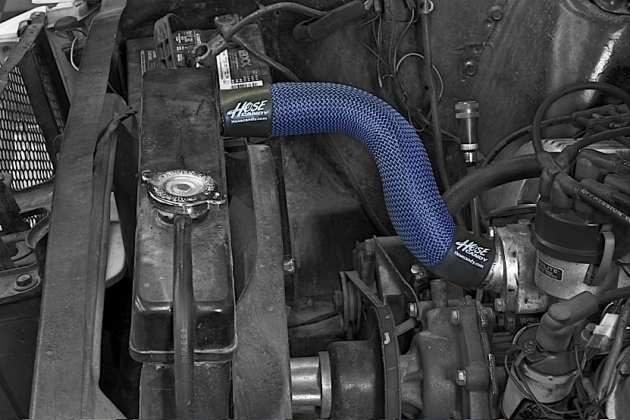 Hose Candy Skin Kits provide the ultimate in custom styling and enhanced performance. This Kit includes Boa Clamps & Hose Skins for your vehicle. For the right fit, there is no “one size fits all”. Open your hood and take a look at your hoses. Do you like what you see? You now have options for those ugly hoses, ugly worm gear clamps and that same old stainless steel braided hose. It's about time you have an option to stainless steel braided hoses or just those plain old ugly hoses. Hose Candy's Hose Skins look great in any application and are featured on many Ringbrothers builds including the award winning Producer Mustang. You can take any stock or custom hose, and install Hose Skins over it, hide the cut ends with Boa clamps and install colored boa sleeves for the ultimate custom look at a fraction of the cost of stainless steel over braided. 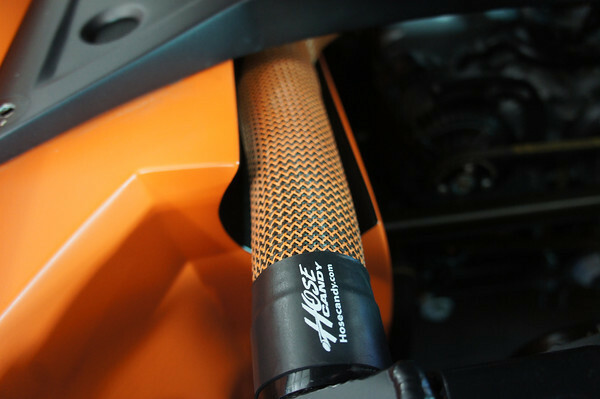 The new Carbon Fiber and Kevlar Hose Skins feature a proprietary weave and coating system called SkinPosite making it now possible for DIY users to “skin” their own hoses in their shop or garage. Prior to the release of Hose Skins with SkinPosite technology, it was not possible for DIY users to effectively install high tech fibers like carbon fiber or Kevlar over hoses, it had to be done by the manufacturer. SkinPosite technology solves several problems when working with high tech fibers: it makes them quick and simple to install, keeps the fiber pattern aligned, conforms to tight bends without “bunching”, prevents the fibers from getting the “fuzzy” look or from catching on sharp objects and they look amazing. Not only do High Tech Hose Skins look great, but they offer light weight protection to help provide bullet-proof hoses. These patented clamps replace ugly worm gear clamps that you never have to be retightened thanks to the dynamic tension technology. You heat them to shrink to size and they will will never let go. Just installed this hose skin on the rad hose of my 71' Camaro. Very easy to install and looks awesome. I've had the steel braided hose covers on other vehicles and these Hose Candy skins blow them out of the water! There's no gaps in the braid where you can see the hose and the boa clamps and heat shrink make it look clean compared to the usual clamps and chunky/cheap looking clamp covers. Real quality product!